Speaking Volumes, LLC, 9781628156492, 194pp. Alexandra Logan was at her wits' end She was nearly broke, her farm was failing, and the local townspeople were angry at her boarders. So she looked to the skies for help...and it miraculously arrived in the very pleasing form of Michael Justice. But Michael was like no man Alexandra had ever met. 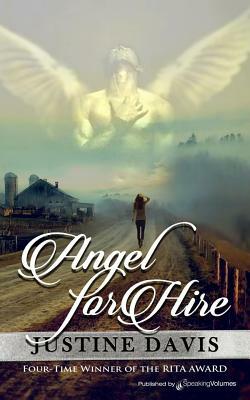 Michael had been sent to earth to help those in need, and Alexandra certainly fit that category. But in no time he was having feelings for her that had much more to do with body than soul Yet how could he ever tell her the truth-that he was no mere mortal, but an angel in disguise? Justine Davis was born during a snowstorm in Iowa but raised in sunny California. She began working right out of school. She worked in law enforcement which she found exciting and never, ever boring. She didn't think seriously about writing for several years. She sold her first novel in 1989. She spent the next two years selling nineteen more books. She has won the coveted RWA RITA Award four times, and has been inducted into the RWA Hall of Fame. Her books have appeared on national best-seller lists, including USA Today. Reading, music and photography are few of the pursuits she follows in her free time. Another favorite hobby is cruising around in her restored 1967 Corvette, with the top down, of course.